Room was comfortable and what you expect in any hotel. Breakfast was great with plenty of choice and the view whilst eating was superb. Enjoyed walking around the rowing lake and adjacent woods with my camera. It has vastly improved since my last visit. Decor good, bed very comfortable. And they now have an in-house chef who produces good food in reasonable time. Have stayed here before . Definitely value for money . Lovely breakfast. The rooms have had a refurbishment .Lovely peaceful location and lovely views. Fab view from my room and a very quiet location. Room spacious and comfortable. Nice to be able to have somewhere to walk after a long drive. Friendly staff , quick check in, free parking and lots of space. Room was clean and I requested interconnecting room or at least next door to each other & the rooms were next door. Great views of the lake. The room was good, the shower was good, the bed was very comfortable. The coissants were finished when I went for breakfast but he staff put more in the oven and baked them fresh for me. Also ... the poached egg was perfect. The location was the only thing in this hotels favour. Room very comfortable. Very quiet too even though there were school children in. 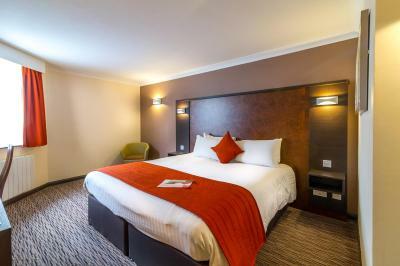 One of our top picks in Peterborough.Dragonfly Hotel Peterborough offers free parking, a sun terrace, a restaurant and scenic views of Thorpe Meadows. Next to the International Rowing Lake, the hotel has rooms with free high-speed Wi-Fi. 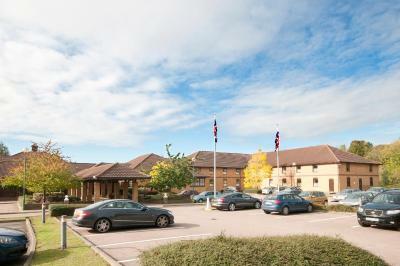 With a peaceful setting just a mile from the city Peterborough, Dragonfly Hotel Peterborough is a 10-minute drive from the East of England Showground. Queensgate Shopping Centre is a 20-minute walk away and Peterborough Cathedral can be reached in 10 minutes’ drive. Dragonfly Hotel Peterborough has been welcoming Booking.com guests since 9 Jun 2009. When would you like to stay at Dragonfly Hotel Peterborough? This bedroom has a flat-screen TV, free Wi-Fi, a hairdryer and tea and coffee-making facilities. 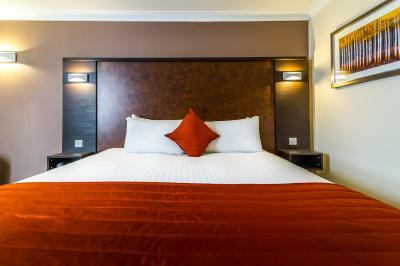 This bedroom has 2 single beds, a flat-screen TV, free Wi-Fi, a hairdryer and tea and coffee-making facilities. House rules Dragonfly Hotel Peterborough takes special requests - add in the next step! Dragonfly Hotel Peterborough accepts these cards and reserves the right to temporarily hold an amount prior to arrival. A security deposit of GBP 25 is required upon arrival for incidentals. This deposit is fully refundable upon check-out and subject to a damage inspection of the accommodation. I could not stand the smell on walking through the entrance. It had a really bad toilet drain smell that you experience sometimes abroad. It was very off putting. However the room was clean. The shower tray was dated and old looking though. My biggest problem however was that the fire alarm in the room had been wrapped and wrapped with tape. I did tell a member on reception. Breakfast was practically gone by 9.30am on Easter sunday. We had to wait a while for extra things to come out. Staff seemed very flustered but it was not overly busy. However, the staff are friendly. More shelving in the bathroom/shower. Nowhere to put anything. Good place for an overnight stop. Easy access into the center. Breakfast was good, with a view. The passages look dated, but it is all functionable & clean. Staff friendly & helpful. If you have a water view even better. A delivery van at 6 am was a minor inconvenience. A gym would be a welcome addition. The only thing to let this hotel down was the bed it was like sleeping on jelly. As I am a vegetarian I am easy to please.